This coming Saturday 13th April is Citizen Science Day, an ‘annual event to celebrate and promote all things citizen science’. Here at the Zooniverse, one of our team members will be posting each day this week to share with you their favourite Zooniverse projects. Today’s post is from Grant Miller, project manager of the Zooniverse team at the University of Oxford. It has a clear and relatable research goal: Help count penguins so we can understand how over-fishing and climate change is affecting their populations, and then use that information to influence policy makers. It has an extremely simple task that for now can only be done accurate by human eyes: Click on the penguins in the image. It’s so simple we have 4-year-old children helping their parents do it! It has an amazing and engaged research team and volunteer community: Even though they are a very small team the scientists take plenty of time to communicate with their volunteer community via the Talk area of the project, newsletters, and social media channels. There is also a fantastic core group of volunteer moderators who put in so much effort to make sure the project is running as well as it should. Half a million king penguins at St Andrews Bay, South Georgia. 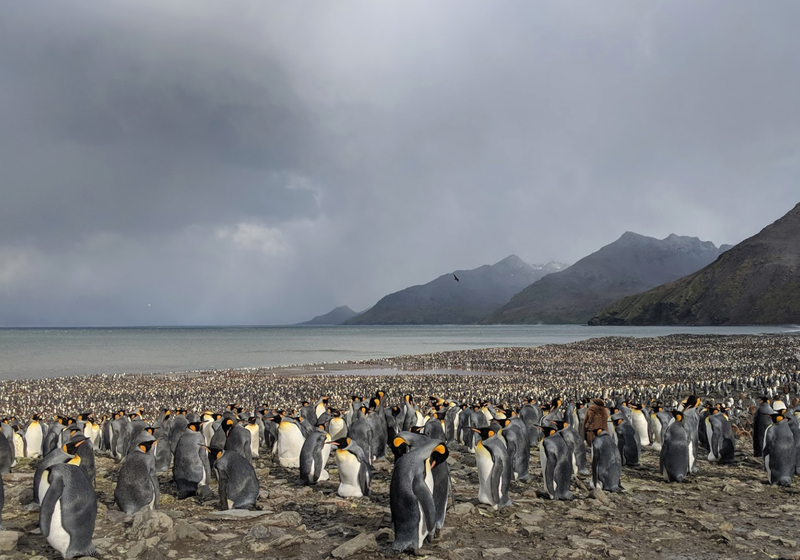 In addition to all of this I was lucky enough to join them on one of their Antarctic expeditions last year, as they went down to maintain their time-lapse cameras and collect the data that goes into Penguin Watch. You can see my video diary (which I’m posting once per day on the run up to World Penguin Day on the 25th April) at daily.zooniverse.org. Get involved in Penguin Watch today at www.penguinwatch.org. This coming Saturday 13th April is Citizen Science Day, an ‘annual event to celebrate and promote all things citizen science’. Here at the Zooniverse, one of our team members will be posting each day this week to share with you their favourite Zooniverse projects. Today’s post is from Laura Trouille, co-PI for Zooniverse and VP of Citizen Science at the Adler Planetarium in Chicago. To follow on Sam’s Monday post kicking off this series and her mention of the diversity of approaches and models for citizen science, I thought it would be fun and helpful to highlight Hawk Talk, a project co-created by citizen scientists and researchers from the Cornell Lab of Ornithology. Do hawks use different kinds of calls in different situations at the nest? Previous researchers have documented Red-tailed Hawk vocalizations, but have been mostly limited to what they can hear on the ground or when briefly checking a nest. The 24/7 Red-tailed Hawk cam gives the community the chance to document vocalizations right at the nest without disturbing the birds! Join them at Hawk Talk for this first round of clips in which you will look at the first week of footage after the nestlings start to hatch. We also invite you to learn more about the Bird Cams Lab, the larger project that Hawk Talk is a part of. Click here to help test new activities for co-created research investigations. Almost every day, the Hawk Talk team posts in the project’s announcement banner. Sometimes they direct you to a specific clip to help figure out what is going on. Other times they let you know about exciting news happening on the live Red-tailed Hawks cam. The team also posts the number of classifications received on the previous day and encourages continued participation. Help them increase the daily number of classification from ~200/day to more! The greater the participation, the more quickly the citizen scientists and researchers can use these data to answer their question. This is a wonderful example of citizen scientists engaged in all steps of the research process. Join the Hawk Talk community and help make it a success! Go straight to Hawk Talk or to the Zooniverse portal for Bird Cams Lab, where you can find both Hawk Talk and the Cornell Lab of Ornithology’s other project, Battling Birds. The team behind the Exoplanet Explorers project has just published a Research Note of the American Astronomical Society announcing the discovery of 28 new exoplanet candidates uncovered by Zooniverse volunteers taking part in the project. Nine of these candidates are most likely rocky planets, with the rest being gaseous. The sizes of these potential exoplanets range from two thirds the size of Earth to twice the size of Neptune! You can find out more about these exoplanet candidates in the actual research note at https://iopscience.iop.org/article/10.3847/2515-5172/ab0a02, and in this blog post by the Exoplanet Explorers research team http://www.jonzink.com/blogEE.html. Finally, both the Exoplanet Explorers and Zooniverse teams would like to extend their deep gratitude to all the volunteers who took part in the project and made these amazing discoveries possible. This post is by Adina Feinstein. Adina is a graduate student at the University of Chicago. Her work focuses on detecting and characterizing exoplanets. Adina became involved with the Exoplanet Explorers project through her mentor, Joshua Schlieder, at NASA Goddard through their summer research program. Let me tell you about the newly discovered system – K2-288 – uncovered by volunteers on Exoplanet Explorers. K2-288 has two low-mass M dwarf stars: a primary (K2-288A) which is roughly half the size of the Sun and a secondary (K2-288B) which is roughly one-third the size of the Sun. The capital lettering denotes a star in the planet-naming world. Already this system is shaping up to be pretty cool. The one planet in this system, K2-288Bb, hosts the smaller, secondary star. 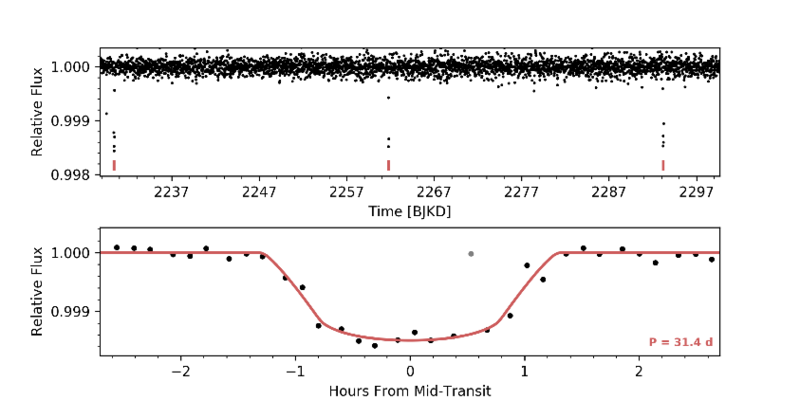 K2-288Bb orbits on a 31.3 day period, which isn’t very long compared to Earth, but this period places the planet in the habitable zone of its host star. The habitable zone is defined as the region where liquid water could exist on the planet’s surface. K2-288Bb has an equilibrium temperature -47°C, colder than the equilibrium temperature of Earth. It is approximately 1.9 times the radius of Earth, which places it in a region of planet radius space where we believe planets transition to volatile-rich sub-Neptunes, rather than being potentially habitable super-Earth. Planets of this size are rare, with only about a handful known to-date. Artist’s rendering of the K2-288 system. The story of the discovery of this system is an interesting one. When two of the reaction wheels on the Kepler spacecraft failed, the mission team re-oriented the spacecraft to allow observations to continue to happen. The re-orientation caused slight variations in the shape of the telescope and temperature of the instruments on board. 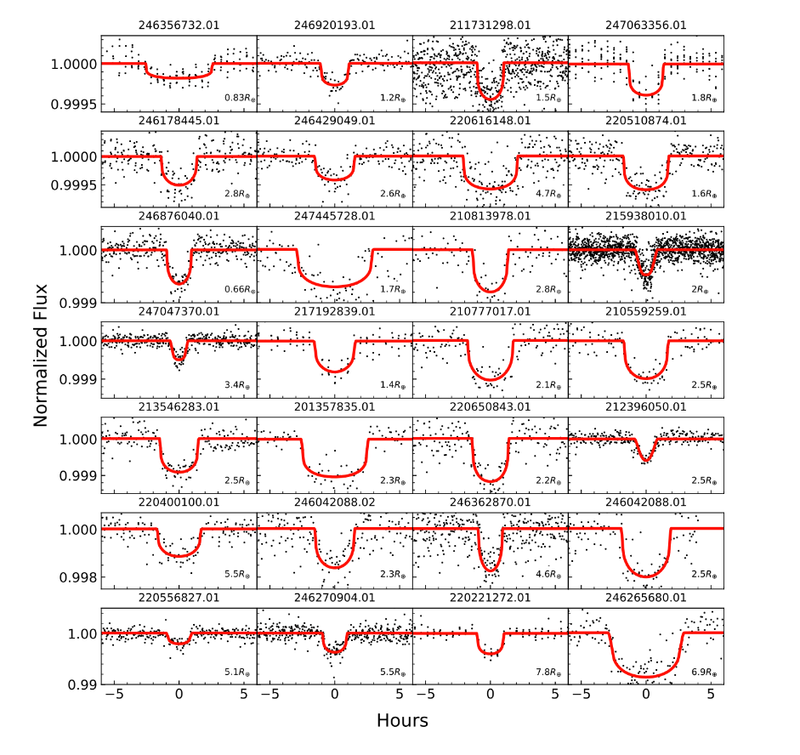 As a consequence, the beginning of each observing campaign experienced extreme systematic errors and initially, when searching for exoplanet transits, we “threw out” or ignored the first days of observing. Then, when we were searching the data by-eye for new planet candidates, we came across this system and only saw 2 transits. In order for follow-up observations to proceed, we need a minimum of 3 transits, so we put this system on the back-burner. The light curve (the amount of light we see from a star over time) with the transits is shown below. Later, we learned how to model and correct for the systematic errors at the beginning of each observing run and re-processed all of the data. Instead of searching it all by-eye again, as we had done initially, we outsourced it to Exoplanet Explorers and citizen scientists, who identified this system with three transit signals. The volunteers started a discussion thread about this planet because given initial stellar parameters, this planet would be around the same size and temperature as Earth. This caught our attention. As it turns out, there was an additional transit at the beginning of the observing run that we missed when we threw out this data! Makennah Bristow, a fellow intern of mine at NASA Goddard, identified the system again independently. With now three transits and a relatively long orbital period of 31.3 days, we pushed to begin the observational follow-up needed to confirm this planet was real. First, we obtained spectra, or a unique chemical fingerprint of the star. This allowed us to place better constraints on the parameters of the star, such as mass, radius, temperature, and brightness. While obtaining spectra from the Keck Observatory, we noticed a potential companion star. We conducted adaptive optics observations to see if the companion was bound to the star or a background source. Most stars in the Milky Way are born in pairs, so it was not too surprising that this system was no different. After identifying a fainter companion, we made extra sure the signal was due to a real planet and not the companion; we convinced ourselves this was the case. Finally, we had to determine which star the planet was orbiting. We obtained an additional transit using the Spitzer spacecraft. Using both the Kepler and Spitzer transits, we derived planet parameters for both when the planet orbits the primary and the secondary. The planet radius derived from both light curves was most consistent when the host star was the secondary. Additionally, we derived the stellar density from the observed planet transit and this better correlated to the smaller secondary star. To round it all off, we calculated the probability of the signal being a false positive (i.e. 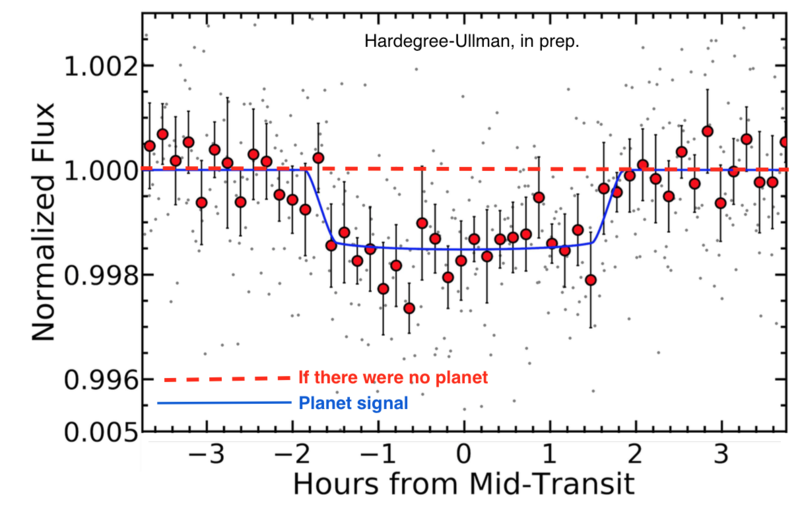 not a planet signal) when the planet orbits the secondary and it resulted in a false positive probability of roughly 10e-9, which indicates it most likely is a real signal. The role of citizen scientists in this discovery was critical, which is why some of the key Zooniverse volunteers are included as co-authors on this publication. K2-288 was observed in K2 Campaign 4, which ran from April to September back in 2015. We scientists initially missed this system and it’s likely that even though we learned how to better model and remove spacecraft systematics, it would have taken years for us to go back into older data and find this system. Citizen scientists have shown us that even though there is so much new data coming out, especially with the launch of the Transiting Exoplanet Survey Satellite, the older data is still a treasure trove of new discoveries. Thank you to all of the Exoplanet volunteers who made this discovery possible and continue your great work! The paper written by the team is available here. It should be open to all very shortly. 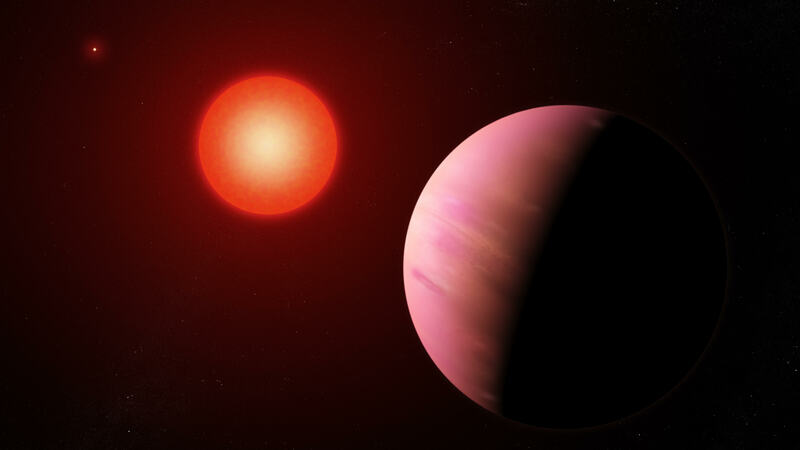 This is the first of two guest posts from the Exoplanet Explorers research team announcing two new planets discovered by their Zooniverse volunteers. This post was written by Jessie Christiansen. Hello citizen scientists! We are here at the 233rd meeting of the American Astronomical Society, the biggest astronomy meeting in the US of the year (around 3000 astronomers, depending on how many attendees are ultimately affected by the government shutdown). I’m excited to share that on Monday morning, we are making a couple of new exoplanet announcements as a result of your work here on Zooniverse, using the Exoplanet Explorers project! Last year at the same meeting, we announced the discovery of K2-138. This was a system of five small planets around a K star (an orange dwarf star). The planets all have very short orbital periods (from 2.5 to 12.8 days! Recall that in our solar system the shortest period planet is Mercury, with a period of ~88 days) that form an unbroken chain of near-resonances. These resonances offer tantalizing clues as to how this system formed, a question we are still trying to answer for exoplanet systems in general. The resonances also beg the question – how far could the chain continue? This was the longest unbroken chain of near first-order resonances which had been found (by anyone, let alone citizen scientists!). At the time, we had hints of a sixth planet in the system. In the original data analysed by citizen scientists, there were two anomalous events that could not be accounted for by the five known planets – events that must have been caused by at least one, if not more, additional planets. If they were both due to a single additional planet, then we could predict when the next event caused by that planet would happen – and we did. We were awarded time on the NASA Spitzer Space Telescope at the predicted time, and BOOM. There it was. A third event, shown below, confirming that the two previous events were indeed caused by the same planet, a planet for which we now knew the size and period. So, without further ado, I’d like to introduce K2-138 g! It is a planet just a little bit smaller than Neptune (which means it is slightly larger than the other five planets in the system, which are all between the size of Earth and Neptune). It has a period of about 42 days, which means it’s pretty warm (400 degrees K) and therefore not habitable. Also, very interestingly, it is not on the resonant chain – it’s significantly further out than the next planet in the chain would be. In fact, it’s far enough out that there is a noticeable gap – a gap that is big enough to hide more planets on the chain. If these planets exist, they don’t seem to be transiting, but that doesn’t mean they couldn’t be detected in other ways, including by measuring the effect of their presence on the other planets that do transit. The planet is being published in a forthcoming paper that will be led by Dr Kevin Hardegree-Ullman, a postdoctoral research fellow at Caltech/IPAC. In the meantime, astronomers are still studying the previously identified planets, in particular to try to measure their masses. Having tightly packed systems that are near resonance like K2-138 provides a fantastic test-bed for examining all sorts of planet formation and migration theories, so we are excited to see what will come from this amazing system discovered by citizen scientists on Zooniverse in years to come! We are also announcing a second new exoplanet system discovered by Exoplanet Explorers, but I will let Adina Feinstein, the lead author of that paper, introduce you to that exciting discovery. We recently uncovered a couple of bugs in the Zooniverse code which meant that the wrong question text may have been shown to some volunteers on Zooniverse projects while they were classifying. They were caught and a fix was released the same day on 29th November 2018. The bugs only affected some projects with multiple live workflows from 6th-12th and 20th-29th November. One of the bugs was difficult to recreate and relied on a complex timing of events, therefore we think it was rare and probably did not affect a significant fraction of classifications, so it hopefully will not have caused major issues with the general consensus on the data. However, it is not possible for us to say exactly which classifications were affected in the timeframe the bug was active. We have apologised to the relevant science teams for the issues this may cause with their data analysis, but we would also like to extend our apologies to all volunteers who have taken part in these projects during the time the bugs were in effect. It is of the utmost importance to us that no effort is wasted on our projects and when something like this happens it is taken very seriously by the Zooniverse team. Since we discovered these bugs we worked tirelessly to fix them, and we have taken actions to make sure nothing like this will happen in the future. We hope that you accept our most sincere apologies and continue the amazing work you do on the Zooniverse. If you have any questions please don’t hesitate to contact us at contact@zooniverse.org. Hi all, I am Coleman Krawczyk and for the past year I have been working on tools to help Zooniverse research teams work with their data exports. The current version of the code (v1.3.0) supports data aggregation for nearly all the project builder task types, and support will be added for the remaining task types in the coming months. This code provides tools to allow research teams to process and aggregate classifications made on their project, or in other words, this code calculates the consensus answer for a given subject based on the volunteer classifications. The code is written in python, but it can be run completely using three command line scripts (no python knowledge needed) and a project’s data exports. The first script is the uses a project’s workflow data export to auto-configure what extractors and reducers (see below) should be run for each task in the workflow. This produces a series of `yaml` configuration files with reasonable default values selected. Next the extraction script takes the classification data export and flattens it into a series of `csv` files, one for each unique task type, that only contain the data needed for the reduction process. Although the code tries its best to produce completely “flat” data tables, this is not always possible, so more complex tasks (e.g. drawing tasks) have structured data for some columns. The final script takes the results of the data extraction and combine them into a single consensus result for each subject and each task (e.g. vote counts, clustered shapes, etc…). For more complex tasks (e.g. drawing tasks) the reducer’s configuration file accepts parameters to help tune the aggregation algorithms to best work with the data at hand. A full example using these scripts can be found in the documentation. At the moment this code is provided in its “offline” form, but we testing ways for this aggregation to be run “live” on a Zooniverse project. When that system is finished a research team will be able to enter their configuration parameters directly in the project builder, a server will run the aggregation code, and the extracted or reduced `csv` files will be made available for download. The Zooniverse has again been asked to enable The Planetary Response Network – this time in response to Hurricane Irma. 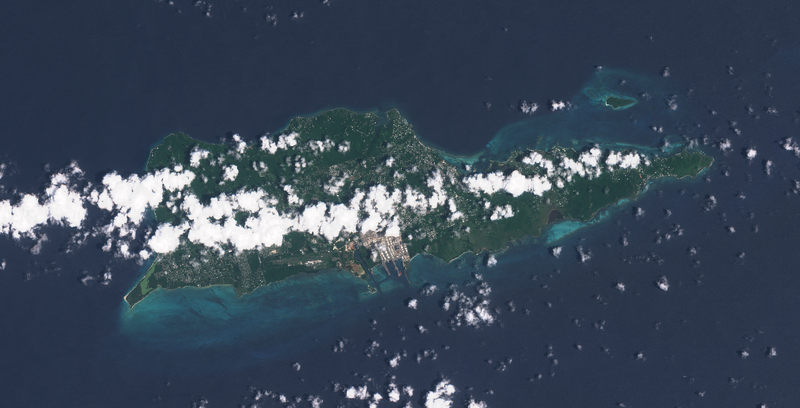 The US virgin Islands as seen from ESA’s Sentinel-2 satellite on 23rd August 2017. Pre-storm imagery like this is used to compare to post-storm images in order to spot major changes. Irma has brought widespread devastation to many islands in the Caribbean over the last few days, and now Hurricane Jose is a growing threat in the same region. By analysing images of the stricken areas captured by ESA’s Sentinel-2 satellites, Zooniverse volunteers can provide invaluable assistance to rescue workers. Rescue Global are a UK-based disaster risk reduction and response charity who are deploying a team to the Caribbean and will use the information you provide to help them assess the situation on the ground. The last time The Planetary Response Network was brought online was to help in the aftermath of the 2016 Ecuador Earthquake. Back then over two thousand volunteers helped analyse almost 25,000 square kilometres of satellite imagery in only 12 hours, and we hope to be of help this time too! Right now we have limited clear-sky images of the affected area, mostly around Guadeloupe, but we are working hard to upload images from the other islands as soon as possible. Join the effort right now at www.planetaryresponsenetwork.org. Stargazing Live 2017: Thank you all! 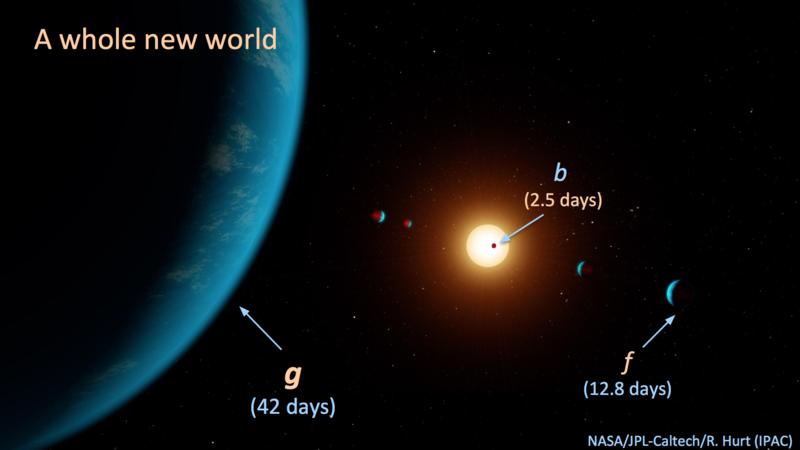 Breaking news… Zooniverse volunteers on Exoplanet Explorers have discovered a new 4-planet system! Computer animation of the 4-planet system. Planet orbits are to scale and planet sizes are to scale with each other, but not with the star and the size of the orbits. Credit: Simone Duca. Congratulations to all* who directly classified the light curves for this system, bringing it to the attention of the research team. And an enormous *thank you* to the 14,000+ volunteers who provided over 2 million classifications in just three days to make this discovery possible. This is equivalent to 3.4 years of full time effort. I *heart* people-powered research! It’s also amazing how quickly we were able to get these data to the eyes of the public — the Kepler Space Satellite observed this star between December 15 and March 4, 2017. Data arrived on Earth on March 7th and Zooniverse volunteers classified it April 3-5, 2017. I *heart* Zooniverse. ExoplanetExplorers.org was the featured project for our inaugural ABC Australia Stargazing Live 3-day, prime-time TV event, which just ended yesterday and through which this discovery was made. Over the years, we’ve partnered with the BBC as part of their Stargazing Live event in the UK. On night 1, Chris Lintott, our intrepid leader, invites the million+ viewers to participate in that year’s featured Zooniverse project, on night 2 he highlights interesting potential results coming through the pipeline, and on night 3, if science nods in our favor, he has the pleasure of announcing exciting discoveries you all, our volunteers, have made (for example, last year’s pulsar discovery and the supernova discovery from a couple years back). This year we partnered with both the UK’s BBC and Australia’s ABC TV networks to run two Stargazing Live series in two weeks. We’re exhausted and exhilarated from the experience! We can imagine you all are as well (hats off to one of our volunteers who provided over 15,000 classifications in the first two days)! Stargazing Live epitomizes many of our favorite aspects of being a member of the Zooniverse team – it’s a huge rush, filled with the highs and lows of keeping a site up when thousands of people are suddenly providing ~7000 classifications a minute at peak. We’re so proud of our web development team and their amazing effort; their smart solutions, quick thinking, and teamwork. The best part is that we collectively get to experience the joy, wonder, and discovery of the process of science right alongside the researchers. Each year the research teams leading each project have what is likely among the most inspiring (and intense) 3-days of their careers, carrying out the detective work of following up each potential discovery at breakneck speed. Over 2 million classifications in just 1 day on planetninesearch.org! Brad Tucker and his team leading PlanetNineSearch.org featured in the BBC Stargazing Live event this year checked and rechecked dozens of Planet 9 candidates orbital parameters and against known object catalogs, making sure no stone was left unturned. We were bolstered throughout with re-discoveries of known objects, including many known asteroids and Chiron, a minor planet in the outer Solar System, orbiting the Sun between Saturn and Uranus. The red, green, and blue dots in the lower left quadrant show Chiron as it moved across the Australian night sky during the Skymapper Telescope Observations for planetninesearch.org. Even though Planet 9 hasn’t been discovered yet, it’s huge progress for that field of research to have completed a thorough search through this Skymapper dataset, which allows us to probe out to certain distances and sizes of objects across a huge swath of the sky. Stay tuned for progress at planetninesearch.org and through the related BackyardWorlds.org project, searching a different parameter space for Planet 9 in WISE data. Understanding this inside joke alone makes it worth watching the show! The Exoplanet Explorers team, led by Ian Crossfield, Jessie Christiansen, Geert Barentsen, Tom Barclay, and more were also up through much of each night of the event this week, churning through the results. Because the Kepler Space Telescope K2 dataset is so rich, there were dozens of potential candidates to triple check in just 3 days. Not only did our volunteers discover the 4-planet system shown above, but 90 new and true candidate exoplanets! That’s truly an amazing start to a project. Chris Lintott shows Brian Cox and Julia Zemiro the possible planets we’ve found so far, using the nearby town’s entire stock of gumballs. Once you all, our amazing community, have classified all the images in this project and the related PlanetHunters.org, the researchers will be able to measure the occurrence rates of different types of planets orbiting different types of stars. They’ll use this information to answer questions like — Are small planets (like Venus) more common than big ones (like Saturn)? Are short-period planets (like Mercury) more common than those on long orbits (like Mars)? Do planets more commonly occur around stars like the Sun, or around the more numerous, cooler, smaller “red dwarfs”? There’s also so much to learn about the 4-planet system itself. It’s particularly interesting because it’s such a compact system (all orbits are well within Mercury’s distance to our Sun) of potentially rocky planets. If these characteristics hold true, we expect they will put planet formation theories to the test. The star is in the constellation of Aquarius (see if can get the WWT), with ra, dec = 23:15:47.77, -10:50:58.91. Host star (V=12): 0.8 Rsol, 0.9 Msol. Late G or early K.
Rotates once every 12 days or so. Sizes: 1.98 Re, 2.03 Re, 2.74 Re, 2.22 Re. Periods: 3.6d, 5.4d, 8.3d, 12.8d. Semi-major axii: 0.04 AU, 0.06 AU, 0.08 AU, 0.10 AU. We predict there may be more planets further out, with similar resonances as the inner planets. The predictions for outer planets are 20d, 30.7d, 47d, etc. (assuming Per_x = 3.56 * 1.538^x.). Planet number 11 would be ~264d, planet 12 ~405d. There are 73 other previously discovered exoplanet systems with 4 or more planets known. In 2372 years, on July 9, 4388AD, all four planets will transit at the same time. If you’re standing on planet e, the nearest planet would appear bigger than the full moon on the sky. Apparent size of other planets while standing on e = 10 arcmin, 16 arcmin, 32 arcmin. If you’re on planet e, the star barely appears to rotate: you see the same side of it for many “years,” because the star rotates just as quickly as planet “e” goes around it. This post wouldn’t be complete without a thank you to Edward Gomez for following up candidates with the Los Cumbres Observatory Robotic Telescope Network. Not only is LCO a great research tool, but it provides amazing access to telescopes and quality curricular materials for students around the world.